This reminds me of a meme I got from Facebook this week. But even as I utter the words, I feel my insides contracting with anxiety and guilt at the sight of her, and while I can't pull it up, I know some bad memory is associated with her. 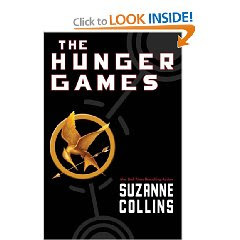 The sentence is from the book The Hunger Games, by Suzanne Collins. I love it! I haven't been this hooked on a book since, well, Edward and the gang. wink, wink. Readers, what is your meme? Or, at least tell me what book you're currently reading! The water was just as cool and as calm as she remembered it from childhood. I have that book on my coffee table- I haven't finished it (I sometimes read several at a time) I love the Gregor series by Collins- it's awesome! "I'll make sure I take as many Death Eaters with me as I can, and Voldemort too if I can manage it." Elizabeth fiddles with a clump of hair that's slipped out of her roller, grimaces at its obstinacy. This book is amazing. You absolutely must read it. Oh and I LOVED The Hunger Games. Can't wait for Catching Fire! Have a super duper Saturday night! I'm re-reading Wuthering Heights by Emily Bronte. I haven't gotten to Page 77 yet, so don't want to spoil it. Thanks for sharing yours, though! As good as Twilight??? Man, I must go check out this book!